"sweet . earthy . mild"
Serve this savory spread with: goats cheese. blue cheese. feta. beef. lamb. sausage. burgers. venison. couscous. salad. dips. pizza base. marinades. 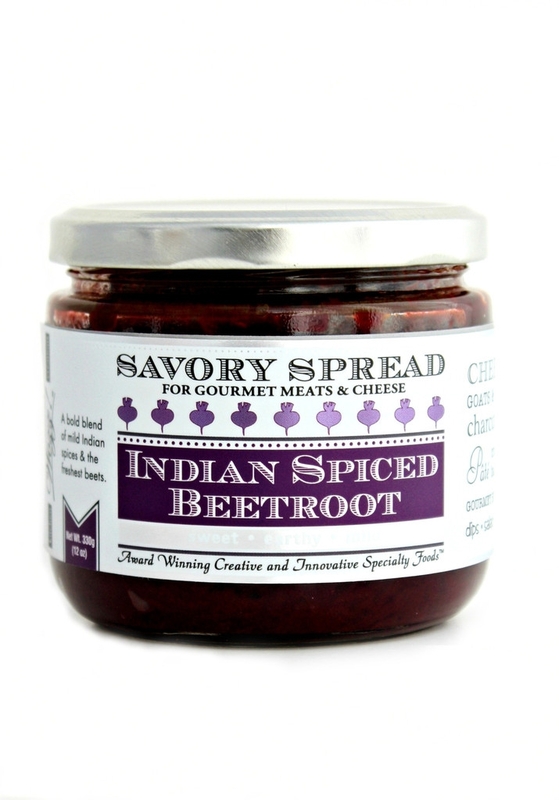 Our Indian Spiced Beetroot Savory Spread is a best seller. We use fresh beets and our own slow cooked blend of Indian spices to make this lovely condiment which is both bold in color and flavor. It's sweet, earthy and mild with a long palette. Pairs perfectly with goats cheese, blue cheese, steak, burgers and is excellent folded through salads, couscous or atop bruschetta. This gourmet spread is an award winner and one of our favorites! A great addition to any gourmet gift basket or cheese board. Try these creative ideas. ✤Fold through cooked couscous with chopped dried fig, nuts and coriander. ✤ Spooned through a salad of arugula with Feta cheese and pistachio nuts. ✤ Yogurt dressing: Add 2 tablespoons with 1/2 a cup of natural yogurt. Season with salt and pepper and fresh chopped mint. Also a great sauce or marinade for lamb! ✤ Beef Marinade: Combine 1 cup dry red wine, 2 tablespoon of Indian Spiced Beetroot, 2 garlic cloves crushed, 1 tablespoon Worcestershire sauce, 1/2 an onion chopped. ✤ Fold into your meatball or burger recipes for a seasoning with a twist. Ingredients: Beets (fresh) Wozz! curry paste (onion. garlic. cumin. coriander. white pepper. clove. cinnamon. sea salt. spices. paprika. star anise. fennel seed. bay leaf. canola oil) Red wine. Cane sugar-brown. Cane sugar-white. Vinegar. Lemon juice 100%. Fruit pectin.